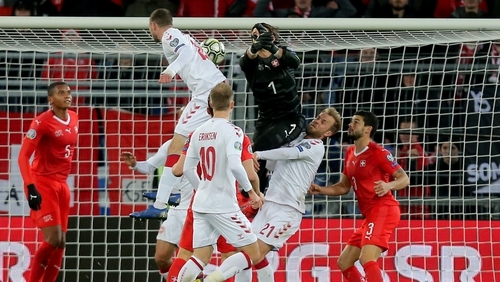 Denmark came from three down seven minutes from time to draw with Switzerland in Basel and leave Ireland top of Euro 2020 qualifying Group D.
Henrik Dalsgaard scored a 93rd-minute equaliser to complete an incredible comeback. The home side were on the verge of making it two wins out of two at the start of their qualifying campaign but Dalsgaard outjumped goalkeeper Yann Sommer to head home and earn Denmark an astonishing and unlikely point. The home team broke the deadlock in the less than 20 minutes in when Remo Freuler beat Denmark keeper Kasper Schmeichel with a cool finish for his first international goal. Captain Granit Xhaka hammered home a 20-metre shot in the 66th minute and Breel Embolo made it 3-0 from close range after Manuel Akanji jumped highest to head across goal. Ireland, who battled to a 1-0 win away to rank outsiders Gibraltar in blustery conditions in their opening match on Saturday, lead the way with six points from two games. Switzerland, who beat Georgia 2-0 in Tbilisi in their opener, are second with four points. The Swiss visit Ireland on 5 September in their next match in the group while Ireland are away to Denmark on 7 June.